Malden Catholic has received a $1 million gift to The Essential Malden Catholic Campaign from the Yawkey Foundation. The Yawkey donation supports Malden Catholic’s capital campaign which provides a new Learning Commons, five new science and engineering laboratories, significant renovation to athletic facilities, structural and technology upgrades to classrooms and a reserve fund to provide financial resources for needy students, faculty training and operations. In granting the funds to Malden Catholic, the Yawkey Foundation cited the importance of the Malden Catholic capital campaign in providing a quality place of learning consistent with the Foundation’s charitable goals. The Yawkey Foundation noted that Malden Catholic High School is one of the few remaining all-boys Catholic high schools in an urban area in New England, and is a highly regarded college preparatory school offering young men an excellent education, a wide variety of extracurricular activities, and opportunities to compete on varsity, JV and intramural athletic teams. The Foundation also commended the school for its ongoing support to the larger community through its numerous volunteer and campus ministry programs. In honor of the $1 million gift, Malden Catholic will name its dining hall for John F. Donovan, graduate of the Malden Catholic Class of 1950. Donovan was a beloved friend of the Yawkey family and served them in his capacity as Counsel for the Boston Red Sox. John Donovan graduated from Malden Catholic High School in 1950, the College of the Holy Cross in 1954, and Boston College School of Law in 1957. He was admitted to the Bar in 1957, and started a private law practice in Chelsea. Donovan was elected to the Massachusetts House of Representatives in 1962 and served as a member of the House Ways and Means Committee and Chairman of the Committee on Bills in the Third Reading. Donovan was Chief Counsel to the House of Representatives from 1972 until 1983. 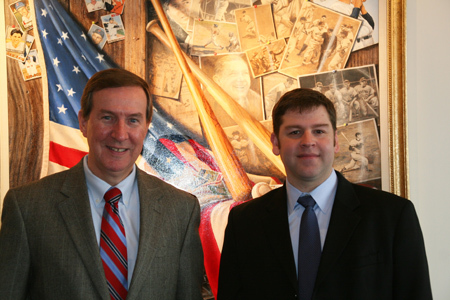 His experience with the Boston Red Sox began in 1946 and progressed through a variety of roles integral to the team, including bat boy, clubhouse attendant (taking part in the All-Star Game and World Series for which he later received a World Series ring), Vice President of Administration and Legal Affairs, General Counsel, and Executive Vice President and General Counsel. The Yawkey Foundations were established more than 30 years ago to further serve the family's many charitable goals. The mission of the Yawkey Foundations is to continue the charitable legacy of Tom and Jean Yawkey by making grants that provide immediate, significant and positive impact on the quality of life of youth, families and the underserved, primarily in the areas which the Yawkeys called home, New England and Georgetown County, South Carolina. For additional information about the Foundations, visit their website at www.yawkeyfoundations.org. For more than eighty years, Malden Catholic High School has maintained a tradition of leading students to achieve academic excellence in a Catholic, familial atmosphere. Annually, 99 percent of Malden Catholic graduates attend college. The Class of 2014 applied to more than 225 colleges and universities distributed across forty states, the District of Columbia and Canada. Graduates last year received college scholarships with a four-year value of more than $15 million. Recognized for its dedicated faculty, challenging curriculum, spiritual guidance, social outreach, and championship caliber athletic programs, Malden Catholic educates young men from more than 40 communities surrounding Boston. The school is accredited by the New England Association of Schools and Colleges, and it is a member of the New England Association of Independent Schools. Further information on the school may be found at www.maldencatholic.org.